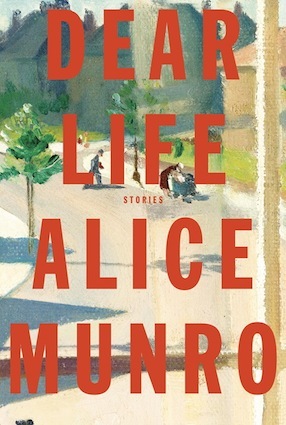 The significant moments in Alice Munro’s latest collection of short stories tend to creep up behind you and hit you in the back of the head with a brick. You read one – you get to the final lines – you think, “I don’t get it” or “oh good grief, is that what I think it is? – you go back and reread it. Then you find the pivotal moment, the line where the storyline changed, where she started the build-up to the climax, or put in the key to the puzzle. It takes patience and skill to construct stories that way, and Munro manages to combine this almost architectural precision with a psychologist’s insight into relationships, emotions and people’s reaction to major life events. For instance, in “Gravel”, about siblings’ conflicts and their relationship with their somewhat dissolute mother, it ends with these words “I see what he meant. It really is the right thing to do. But, in my mind, Caro keeps running at the water and throwing herself in, as if in triumph, and I’m still caught, waiting for her to explain to me, waiting for the splash.” (p. 109) The buildup to the reader’s recognition that the narrator’s sister killed herself in the gravel pit only dawns when you go back to earlier in the story, when she describes what happened. “I was to go back to the trailer and tell Neal and our mother something. That the dog had fallen into the water. The dog had fallen into the water and Caro was afraid she’s be drowned. Blitzee. Drowned. Drowned. But Blitzee wasn’t in the water.” (p. 102) Munro stretches out the suspense to the very last part of the story – not mentioning, except at the end, that the child had actually drowned. Like the narrator lives with the effects of the accident for the rest of her life, the reader stays in a state of suspense, waiting to exhale, until the last lines. At the same time, she does it in clean, elegant language, every word very carefully selected. There isn’t an adjective or simile out of place. It is restrained writing, like contained grief. It evokes a similar response in the reader, recognition, empathy, but also sadness and a sense of dislocation or alienation. She creates distance between the reader and herself through her use of language and form, but at the same time, closeness through the situations and characters who are mostly ordinary people. This dichotomy continues through her placing of these plain, often self-doubting, wary people, in disturbing, explosive or perverse situations. Yet, she keeps these situations small in scale, it’s not like the people are involved in holocausts or world wars. In “To reach Japan”, a woman’s life unravels after she becomes obsessed by a man she had briefly met once at a party. She writes this man a letter consisting of a haiku: “Writing this letter is like putting a note in a bottle – / And hoping / It will reach Japan.” As she disconnects with her old life, and her marriage, her daughter notices, as children often do, seeing clearly what adults cannot. “Even before the useless, exhausting, idiotic preoccupation with the man in Toronto, there was the other work, the work of poetry that seemed she had been doing in her head form most of her life. That struck her now as another traitorous business – to Katy, to Peter, to life. And now, because of the picture in her head of Katy alone, Katy sitting there amid the metal clatter between the cars – that was something else, she, Katy’s mother, was going to have to give up.” (p. 28) The clincher in this story is that she realises this too late. The man in Toronto is waiting for her, the message in the bottle has reached Japan. This is precisely what happens in the stories in “Dear Life”, where, for the most part, until the ending, and sometimes even then, the reader remains feeling fairly sober and objective, even unmoved, by the plight of the characters. That makes Munro’s endings, exposés, explanations all the more surprising, and they leave lingering effects on the reader, who can no longer objective. This is why readers will always revisit Munro’s old collections and eagerly await her new books. The morning after the announcement of her Nobel Prize, I was in my local branch of Chapters bookstore. I was looking for Munro’s books, realising that my mother had read them in South Africa and still had the copies. I was not the only one down on my knees amongst the Ms in Fiction. So was an elderly gentleman, and the teenager who works the till – all looking for a well-loved author. Telephone interview by Nobelprize.org’s Adam Smith with Alice Munro following the announcement of the 2013 Nobel Prize in Literature, 10 October 2013.